For many years, I paid an exterminator $75 a quarter to come to my house and spray outside it — and inside the garage — to prevent unwanted bugs, especially cockroaches (an ick factor when living in the South). I could barely afford it, but after I saw a cockroach (did you know some of them fly?) in the air near my young son’s bed one night many years ago, I decided it was a health and safety concern and I had to bite the bullet and do it. Multiply $300 a year by 20 years, and that’s $6,000 spent for pest control. A healthy chunk of change. Several years ago, a friend who owns rental property told me she does her own extermination and explained how. It was a true lightbulb moment! Simply go to a store like Lowe’s and buy a concentrated home insect control product, which costs about $10. Put on rubber gloves and a pair of plastic goggles. Mix the product with water as directed to make the amount needed inside a handheld pressurized spray pump (which costs about $30). Prime the pump and spray the concrete foundation all around your house, where insects enter. Also spray around kitchen windows and patio doors. Spray the inside perimeter of your garage, too, at the intersection of the floors and walls. I don’t recommend spraying along the walls of carpeted rooms because there’s really no need to if you covered the exterior foundation of those rooms. Also, when I bought my house — which was two years old at the time — the carpet throughout was bleached-looking and had lost all color along the edges of every single room — which I’ve always thought was probably from poorly-applied pest control products sprayed along the baseboards. I’m sure chemicals have improved since then, but once you’ve seen something like that, you never want it to happen again — especially if you invested in new carpeting in the meantime! I exterminate the house every two months (to be on the safe side — although you could go longer), and it takes about half an hour each time and costs about $20 a year for insecticide. The only bugs I ever see in the house are dead ones, and this practice has resulted in a hefty savings of about $280 a year! This entry was posted in DIY extermination, DIY pest control, do it yourself home extermination, do it yourself pest control, extermination, money saver, pest control, saving money, ways to save and tagged diy extermination, diy pest control, do it yourself extermination, do it yourself pest control, extermination, money savers, pest control, saving money, ways to save. Bookmark the permalink. What great tips! I can’t stand any critters in my home so I will be doing these for sure! Never even thought it was something ya could do yourself, but it’s a snap. Who knew? Great post! If you can keep up a regular ‘de-pesting’ routine its much easier to stay on top of it all. But it also helps to get a professional in to see the things beneath the surface with equipment such as thermal imaging which you may not be able to see. For the past little bit, my wife and I have been noticing some bugs around our home and garden. For just this last week, we have seen quite of few of them. We are really worried that if we don’t do something, that we are going to have an infestation. So I really appreciate you posting this about this solution that you used to help with your pest problem. I’ll have to try this out, and see how well it works for us. Thanks for writing, Brandon, and I hope it works! 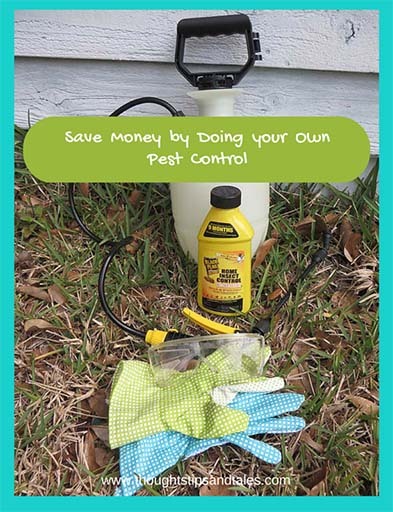 Recently bought some pest control stuff that’s already mixed with water at a discount store like Big Lots – and that eliminates the mixing part and makes doing this even easier. It was $14 for a huge plastic container with pesticide and a spray hose that feeds from the container. Very convenient! I just came across another blog post searching for DIY pest control and I came to know there are several natural pest control materials present within our kitchen which we use for our daily needs. Things like peppermint, lavender, lemongrass etc. They are very useful against a lot of harmful insects. Before tackling a rodent problem, learn what you can about the specific animal you want to target. Create a list of which items these pests hate, and discover the things that attract them. Adapting your approach to the pest you are dealing with is the best way to clean your home. Lowe’s is definitely a useful resource for those who go the DIY method. It’s nice that your friend was able to share her money saving tip. You’re right. I learn a lot of useful tips from my friends! Great advice! This seems like a good and inexpensive way to keep pests out of your home and garden. Thanks for sharing! Yes! We have done this as well. And as an added bonus, there’s almost always enough left over your neighbor and a couple of your friends could use it as well. Thanks for the great post. I do love saving $75 every time I do it! Thanks for stopping by.